Get a glimpse at the technology powering the Shipwire. 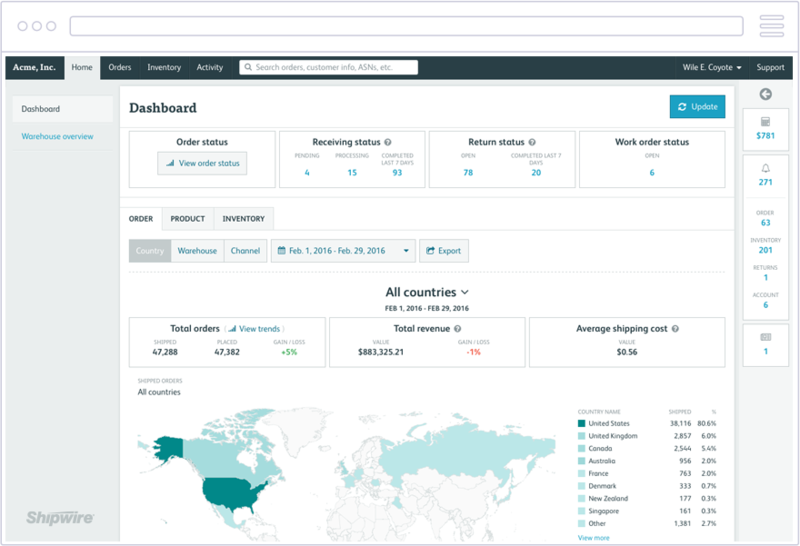 The Shipwire Platform includes tools for you to grow and manage your business. Visualize transactions and access information quickly. Manage work orders and order flow among commerce systems. Automate reporting and data analysis. Manage settings and preferences to define business rules and operations. Limit third party applications from accessing your account information with user controls. Extend your reach into global markets with prebuilt connectors, trusted partners and extensive tools for your development team. Communicate order, inventory and delivery information to Ingram Micro managed warehouses, your locations and drop ship locations where your product is stored. Over 154 fully managed locations in 45 countries support custom and on-demand fulfillment solutions for B2C and B2B commerce. Route orders through storage locations where you pick, pack and ship them using labels generated within your Shipwire Platform account. Manage your supplier network, relay orders and provide a consistent experience to your customers using powerful automation technology. Continual improvement with no maintenance windows. World-class engineering, design and product management. Enterprise security, 99.9 percent uptime and complete SSL. Redundantly deployed in data centers around the world. Weekly platform updates in response to user requests. Manage your order fulfillment operation with software that’s flexible, intelligent and trusted.